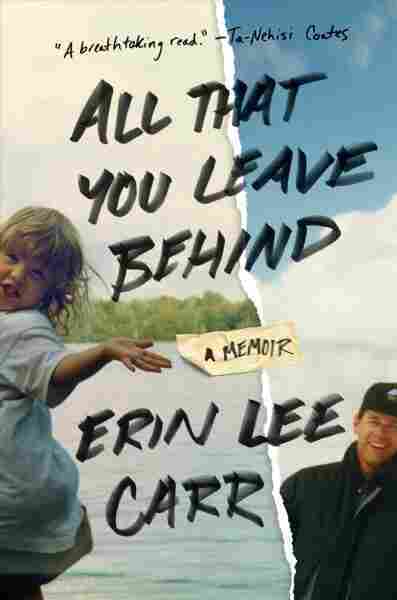 In 'All That You Leave Behind,' Erin Lee Carr Writes About Her Relationship With Dad David Carr Erin Lee Carr's memoir about her relationship with her dad, David Carr, provokes gratitude and empathy — but she fails to investigate herself with the rigor she brings to her own journalism. Last winter, I took my father to the live journalism show Pop-Up Magazine. Neither of us expected to cry, but five minutes into documentarian Erin Lee Carr's beautifully constructed tribute to her late father, the famed New York Times media reporter David Carr, we were sobbing. Carr wept, too. I left the event deeply moved, and deeply grateful to have my own father there. I expected Carr's memoir, All That You Leave Behind, to elicit the same level of feeling. On the page, however, she is much less successful at getting her emotions across. In part, this might be a question of voice. Carr is a highly accomplished filmmaker, best known for her HBO documentaries Mommy Dead and Dearest and Thought Crimes, and her prose has a screenwriter's economy. She moves rapidly from scene to scene, never lingering on the complex emotions that memoirs are built to investigate. As a result, All That You Leave Behind functions far better as a portrait of David Carr than as one of the writer herself. She consistently lets her father overshadow her on the page. This may be intentional. Toward the book's end, Carr cites her father's journalistic reminder that "you are not an intrinsically interesting subject," and yet a memoirist must be interested in herself. How else can a memoir work? Carr often seems guarded or shy on the page, as if shielding her emotions from the reader. This is especially true in the chapters dealing with her alcohol abuse. She traces her struggle to get sober while processing her father's death, but nearly every scene ends with a blackout; she never tries to find out what happened, nor does she give voice to her sister, her best friend, and her boyfriend, all of whom were present throughout. Nor does she fully examine an earlier attempt at sobriety, after her drinking began to threaten her career. Her father was alive then, and when she reached 90 days, he accompanied her to an Alcoholics Anonymous meeting, speaking to the room about "his own attempts at ninety days, how hard won it was, and what it was like to see his kid get there." Carr glosses over the speech itself, hurrying into a blankly positive reaction: "I was proud to be with him, and felt lucky to have him." This is often Carr's way. She presents facts, then a neat summary of her feelings. When she allows complexity, it tends to be in lists of questions, which is clearly how her mind operates: After her father dies, she emails a questionnaire to friends who have coped with grief. More questionnaires would have suited All That You Leave Behind, but Carr often cuts them off too soon. In a section on her father's relapse into drinking during her adolescence, Carr approaches anger, then ducks into summary: "Who drives their kids drunk? Who drinks on the way to a parent-teacher conference? I learned quickly that the circumstances did not matter when it came to my dad and alcohol." Carr's struggles with addiction link her to her father, but their most meaningful bond is ambition. She writes honestly and gratefully about her father's unwavering career support and guidance, and is excellent at noting the privilege of his help, as well as her resulting insecurities: "How do I have a career without you?" she asks in one list. "Was my moderate success because of you? ... Why were you so hard on me?" What she never fully explores is "the tension of being both his kid and his mentee, one relationship always in conflict with the other." That tension simmers quietly through the memoir. I wanted far more from a scene at South by Southwest, when Carr drinks more than she means to at her father's annual media party. "I went in for the hug with my dad," she writes at the start of the scene, "and he started introducing me as his kid, who worked for VICE. People were kind, but I could tell instantly that I was not who they really wanted to be speaking with at such an event... [Before] I knew it I was seven beers deep." It's difficult to read Carr's behavior here: Does she feel diminished, or embarrassed? Out of her depth? Is she trying to rebel against her father, or, as she occasionally wonders, imitate his younger self? The closest Carr offers to an answer comes, obliquely, from her father. After a bad breakup, he emails her to say, "[He] was a significant person in your life, but sadly not a significant person." Carr takes this as comfort, and as an important lesson. It's also a lot of pressure. The mandate to be a significant person is present on every page in All That You Leave Behind. It may well be what stood between Carr and a more revealing, more nuanced, and perhaps messier version of this memoir. As is, the book provokes both gratitude and empathy. But Carr's significant writing, in which she investigates herself with the rigor she brings to her journalistic subjects, is yet to come. Lily Meyer is a writer and translator living in Washington, D.C.